How many people have time to eat breakfast in the morning? Mornings can be a hectic time for most, and hunger often goes unnoticed until later in the day. Unfortunately, hunger only builds and skipping breakfast can lead to excessive consumption of calories at lunch, snack times, and dinner (oh, and at “fourthmeal”, thank you Taco Bell for coining that term). Eating breakfast is a simple favor you can do for yourself that can benefit you in the long run. Perhaps you’re not in the habit of eating breakfast because you just don’t have an appetite upon waking up? One solution is to wake up 10-15 minutes earlier and go through your normal morning routine of getting ready for work, school, etc. When you’re done, you may actually have small twinges of hunger that you didn’t notice before, if not, something like a smoothie or juice may be appropriate so that you’re not uncomfortably full. Allowing yourself that extra 10-15 minutes at the end of your normal morning routine enables you to prepare something to eat without feeling rushed for time. A whole-grain pumpkin spice muffin (recipe to come soon!) and a green smoothie (recipe suggestion listed below). These foods make a healthy breakfast and provide energy throughout the morning. Listed below are some other recipes and suggestions for a quick, easy, healthy first meal of the day! When picking a cereal, look for whole grains. Avoid sugary, processed cereals that will cause you to crash mid-morning. Some of my favorite cereals are by the company Nature’s Path, which uses organic ingredients and can be found in health food stores (and in the health food aisle of conventional supermarkets). Find yourself a blender and hop on the green-smoothie train. Use 1 banana (fresh or frozen), 1-2 cups baby spinach, kale, or other green, leafy vegetable. Add a liquid component. You can use almond milk, soymilk, etc. You may want to add frozen or fresh berries for a fruity sweetness. Blend well! Oatmeal is a great way to start your day. Cook old-fashioned oats in the microwave for 3 minutes (keep an eye on the bowl though, as sometimes it can overflow). You can add nuts, fresh or dried fruit, peanut or almond butter, or coconut flakes with banana and mango for a tropical treat! 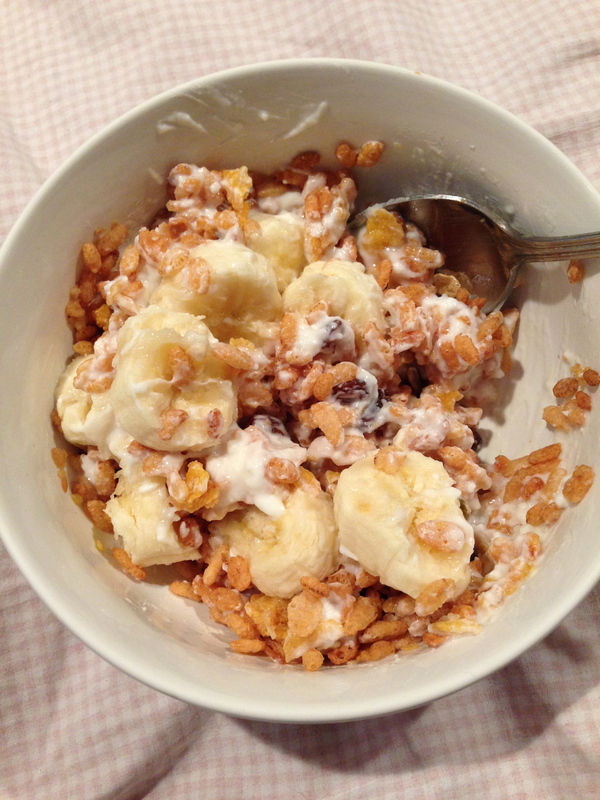 Whole grain cereal (here I used brown rice crisps with added raisins (adds a few grams of fiber) and half a banana with Trader Joe’s dairy free coconut yogurt. Quick and easy! There are many other ways to enjoy a healthy breakfast. 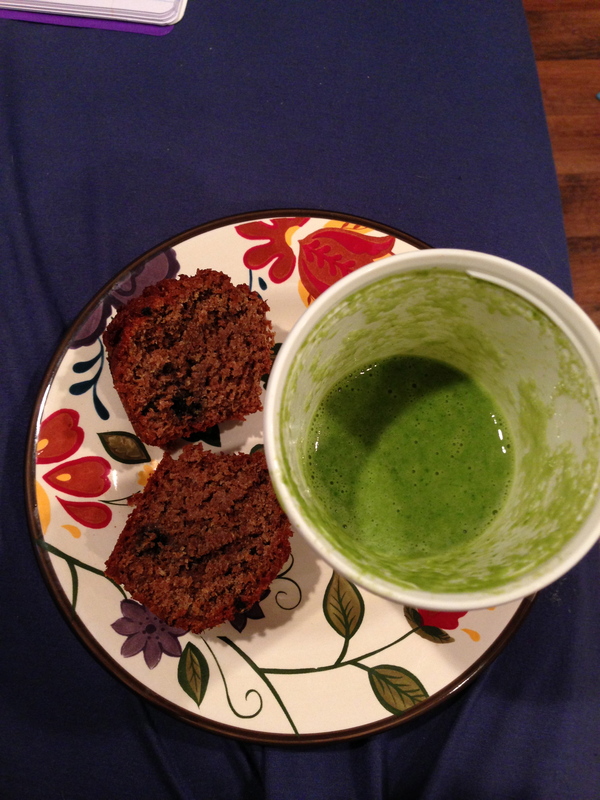 Keep reading my blog and I’ll post some muffin recipes that are surprisingly nutritious while sinfully delicious. We all know how to ingest food, but how does your style of eating influence your health and every day life? Some of you may be asking yourselves, “Style of eating? What is that?”. Your style of eating can be defined by how you choose the foods you eat. For instance, some people choose to eat whatever is convenient due to their busy schedule, others may plan ahead their meals for the day or week, and others may be more in touch with their bodies and eat what they like, while still focusing on having an overall healthy diet. I first became aware of “eating styles” when I read the book “Intuitive Eating” by Evelyn Tribole and Elyse Resch (both Registered Dietitians). The authors describe several different eating styles, with a focus on how repetitive dieting, stress, and emotions can have a huge effect on how we eat and use food for other reasons besides hunger. If you haven’t read the book, I highly recommend it to anyone who finds themselves stressed out about what/how to eat, or to anyone who finds the concept of mindful/intuitive eating interesting (I use the words mindful and intuitive interchangeably, as do the authors of “Intuitive Eating”). What is mindful eating, you ask? Mindful eating (to me, at least) means being in touch with your body, determining your hunger and satiety signals before and after eating, respectively, and paying close attention to your food and eating experience in the present. Mindful eating makes sense for so many people, from chronic dieters who are fed up with calorie counting, to emotional eaters whose comfort lies at the bottom of a pint of Ben & Jerry’s. Mindful eating has been shown to be very effective in preventing binge eating, which is more common than you think (Binge Eating Disorder affects 2.8% of the U.S. population). Being present (on a mental, emotional, and physical level) while eating also makes food more enjoyable because you’re focusing on the sensual experience of food (taste, texture, smell, which may go unnoticed if you’re in a binge or too focused on the macronutrients of your meal). While mindful eating is a beneficial practice, it’s still important to consume a healthy diet, and sometimes focusing too much on the pleasurable sensations of eating can lead one to make unhealthy choices (because delicious food is sometimes not the healthiest). Many dietitians/nutritionists advise their clients to have a loose plan of what they’ll eat in advance to avoid being overwhelmed with unhealthy choices when hungry. I know when I’m in a rush or stressed with life in general, I don’t make the healthiest food decisions and this leaves me feeling guilty and physically tired. It’s also incredibly difficult to be a mindful/intuitive eater when you’re used to eating a certain way, therefore taking small steps is a great way to achieve balance between health and pleasure. How do you find a balance between health and pleasure when it comes to eating? 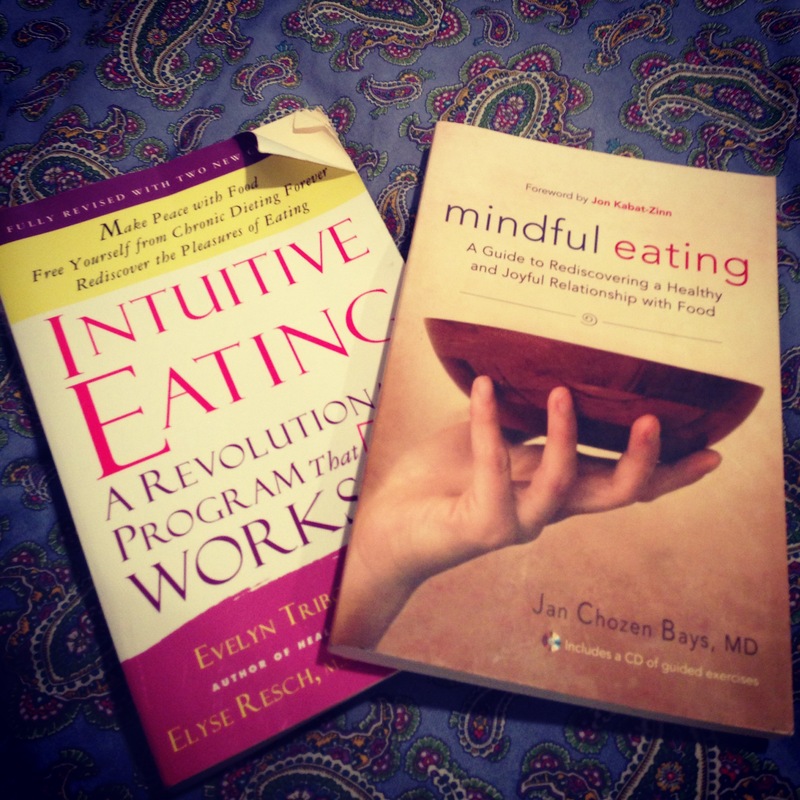 For further information on Mindful Eating approaches, take a look at the links below or pick up a copy of “Intuitive Eating” (Evelyn Tribole, Elyse Resch). One of the most interesting things about being a student of nutrition in an academic setting is learning to distinguish between valuable information related to nutrition, and not-so-valuable advice provided by the media and diet industry. In our society, we are constantly bombarded with new miracle diets and this has been going on ever since news could travel. In high school, I remember I attempted to go on the Atkin’s Diet. I was hooked on the promise of rapid weight loss (I wanted to lose 10 lbs, fast! ), even though the thought of eating unlimited servings of meat every day was not my cup of tea. I lasted about 3 days on that diet, and afterwards I became a strict vegan, possibly because I felt so disgusted with the way I was eating, or possibly because I love animals. I, like many people, fall prey to media hype about diets and health. Nowadays, it’s more than experts touting advice on TV and in books. On social media, it’s easy to believe friends (and strangers) claiming success as a result of their diet plan, but one should always question how sustainable and healthy it is in the long run. Many fail to realize that not being educated about nutrition, as well as misunderstanding what your body actually needs to function, can lead to detrimental health effects. Trying every new diet that pops up can quickly lead to feelings of failure when it becomes difficult to follow or not working in your benefit. Consulting a Registered Dietitian is a great way to figure out what YOUR body actually needs depending on your health status/concerns, age, activity level, weight, and any food intolerances/allergies you may have.